Concern of Standard and Poor's reducing Britain's credit rating leads to the question on everyone's mind — will the US be next? 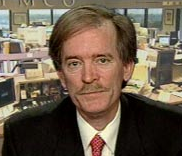 On one side is co-chief investment officer of Pimco, Bill Gross who says it will likely happen, and on the other side is Treasury Secretary Tim Geithner who says no. Continue reading to learn their arguments in this post by Tim Iacono from The Mess That Greenspan Made. Pimco co-chief investment officer Bill Gross and Treasury Secretary Timothy Geithner are at odds regarding the prospect of the U.S. losing its triple-A credit rating. In a world crowded with nations whose budget deficits are rising sharply and whose central banks are furiously printing money in an attempt to soften the economic pain, it seems that the general shift downward will just redefine what it means to be a good credit risk. Kind of like, "less bad" is the new "good". According to this report at Bloomberg, after Standard & Poor's raised the possibility of the British government getting taken down a notch or two, Gross figures it's only a matter of time until we lose our AAA credit rating in the USofA, but it won't happen anytime soon - this sort of thing should be expected when government debt is growing at near-exponential rates and the printing presses are running 24 hours a day. “Both the U.K. and the U.S. have prospective deficits of 10 percent annually as far as the eye can see,” Gross said. “At some point over the next several years” the debt of each “may approach 100 percent of GDP, which is a level at which country downgrades tend to occur,” he said. The U.S. will issue a record $3.25 trillion of debt in the fiscal year ending Sept. 30, according to Goldman Sachs Group Inc., one of the 16 primary dealers that trade directly with the Fed and are required to participate in Treasury auctions. “The market knows and believes that both the U.S. and the U.K. are quite similar in terms of their debt levels and debt trends,” Gross said. He went on to note that the Fed's balance sheet will probably increase to $5 or $6 trillion by the time they're done printing money, all the newly created dollars aimed at restoring the proper functioning of a financial system that more and more people are realizing is patently unsustainable in its current form. Meanwhile, Tim Geithner over at the Treasury Department thinks that tumbling prices for U.S. debt are a sign of a resurgent U.S. economy, rather than an inexorable march toward the status of deadbeat borrower. Admittedly, the term "deadbeat borrower" isn't quite correct here because any government that operates a printing press can always find a way to pay its bills - just look at Zimbabwe. It simply becomes a question of the value of the money that is used to pay those bills. “It’s very important that this Congress and this president put in place policies that will bring those deficits down to a sustainable level over the medium term,” Geithner said in an interview with Bloomberg Television yesterday. He added that the target is reducing the gap to about 3 percent of gross domestic product, from a projected 12.9 percent this year. 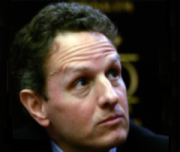 It’s “critically important” to bring down the American deficit, Geithner said. In its latest budget request, the administration said it expects the deficit to drop to 8.5 percent of GDP next year, then to 6 percent in 2011. Ultimately, it forecasts deficits that fluctuate between 2.7 percent and 3.4 percent between 2012 and 2019. Absent another asset bubble of some kind - preferably the kind that both Wall Street and the government can get behind, rather than, say, surging commodity prices that hurt as much as they help - it's hard to imagine how the U.S. is going to generate enough economic growth and tax revenue to bring these deficits down anywhere close to what the White House projects in the years ahead.